Does your backyard need an upgrade? Perhaps you want to expand the living space. No matter what your requirements are, you can make it possible with top 10 best gazebos reviewed by us here. With one of these, you can shelter your BBQ grill, pit fire, and hot tub from the wind and sun. With us, you can find a canvas top, hardtop canopy, to a portable one to take with you anywhere. Do not limit your imagination and select one according to your space, budget, and needs. Start creating your outdoor haven today. 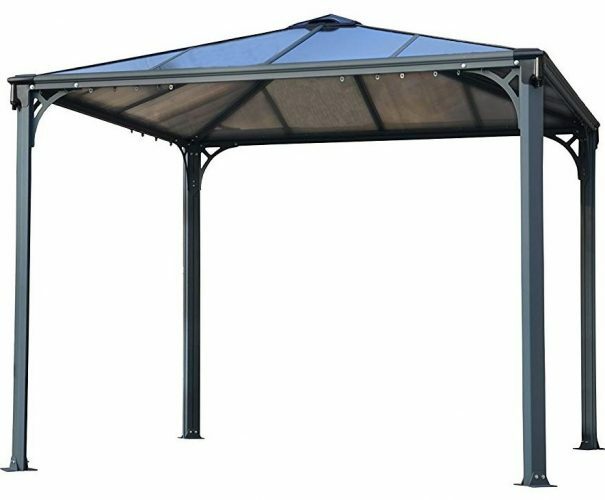 For adding shade to your backyard or covering your BBQ grill, you need the Sunjoy Gazebo. The dense canopy protects you from the sun and has solid posts with built-in LED lights. There are two shelves to place your utensils and has hooks. The construction is durable with the powder-coated steel frame. You can add shade and enjoy outdoor cooking with friends. For a portable gazebo for tailgating, you need the Gazelle gazebo that measures 7 x 11 feet and fits up to eight people. The polyester construction is UV and water-resistant. The side panels have a mesh structure and the corners reinforced with two layers of fabric and pole pockets. There is a front door you can close with a zipper and comes with twelve ground stakes and size tie-down ropes. The next gazebo is another portable design and looks impressive standing in the backyard. The Coolaroo Isabella is lightweight to set up, and the material is UV protected and breathable. The frame comprises powder coated steel, and it is easy to clean. The design is stylish, durable, and comes at an affordable price. 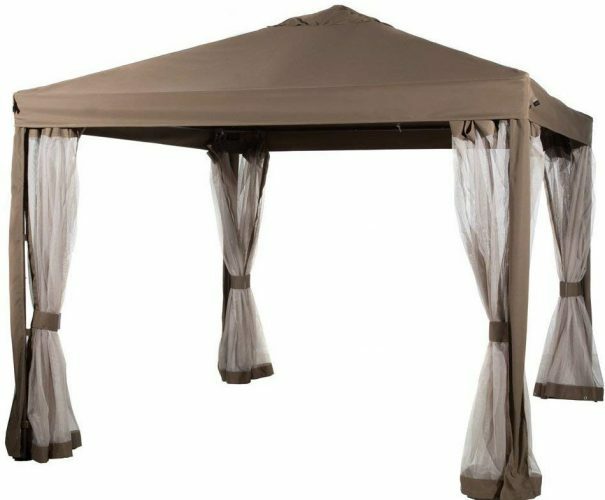 For a perfect addition to any backyard, you need the Abba Patio Garden Canopy. 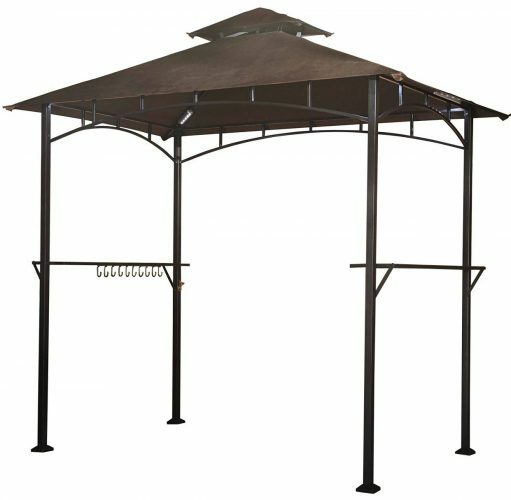 The gazebo measures 10 x 10 feet and has a woven mesh screen with powder-coated steel frame. The top is made of polyester and UV treated. The constructions durable and makes it a great buy at this price point. The roof has double ventilation and protects you from the sun. There is bug netting, and you can use at home or for recreational use. 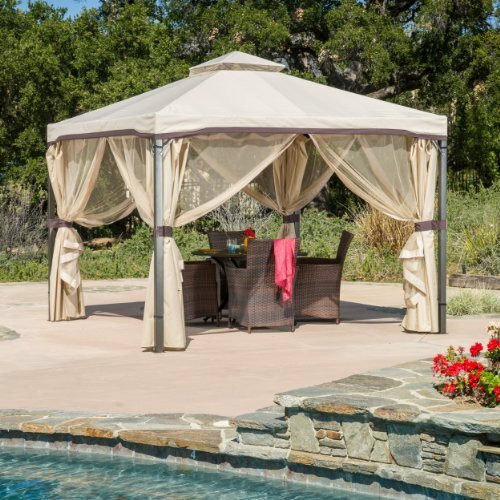 For the best gazebo, you need the Sonoma made with a durable steel frame and a polyester canopy. The drapery around the gazebo you can adjust for added shade. You can buy the product in a beige and light brown color. The dimensions are 118-inches in length and 118-inches wide with a height of 107-inches. The unit has a sturdy design that holds well in the rain and wind. You receive all the hardware included to set it up. Do you prefer something more portable when searching for the best gazebo look at the PHI VILLA? You can pop it open quickly to provide you with shade and great for any event. The canopy has an Oxford fabric structure with a silver coating. The material is flame resistant, and the steel frame is powder coated. You can adjust the unit in three different sizes, and you can alter the shade coverage. 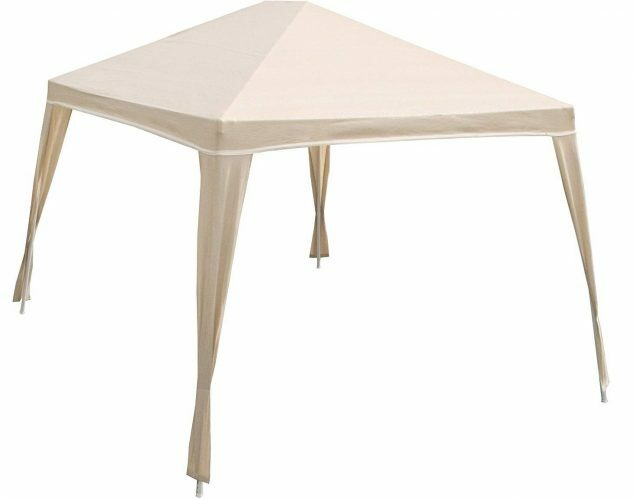 For a solid good looking affordable gazebo look at the Sunjoy Summer Breeze. 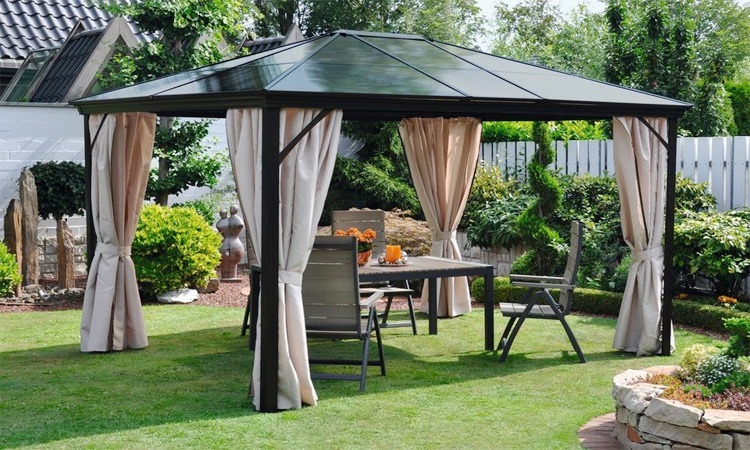 You can create a fantastic outdoor living space with this canopy. The product assembles in minutes and has a polyester design that is easy to clean. The frame is durable and has a powder coated finish that is chip and rust resistant. 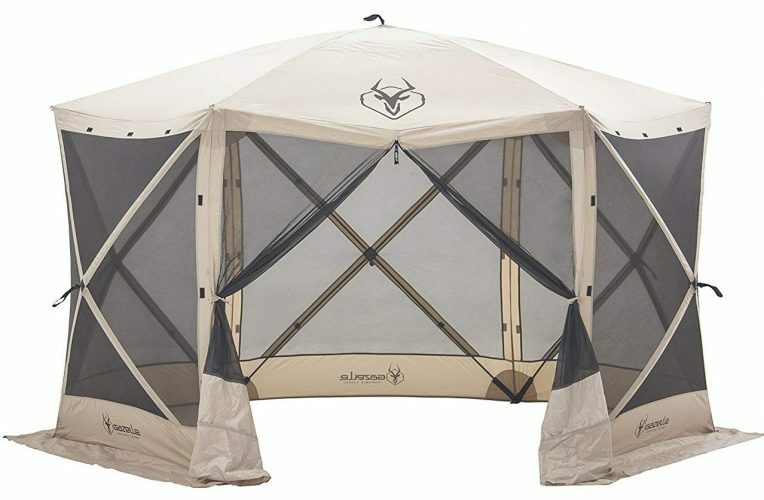 For handling the wind and enough space to sit this canopy is perfect. 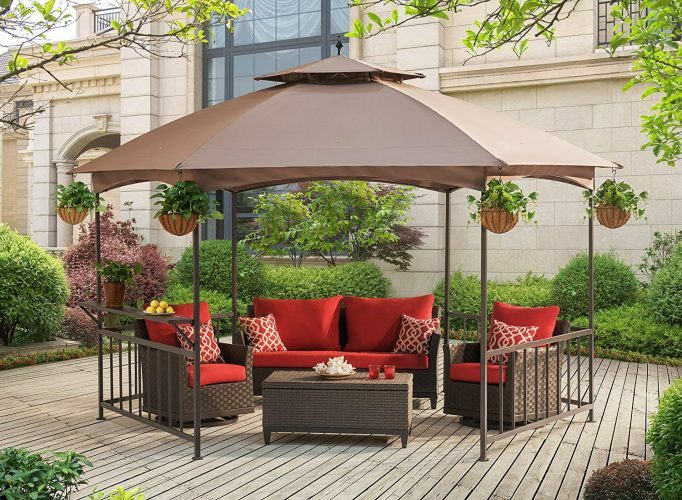 For a stylish focal point, you need the Madison Pavilion Gazebo. Not only does it have a hexagonal shape with two-tier domed soft-top it looks stylish. There is a railing with serving shelf on the inside and the steel frames durable and rust resistant. Another fantastic thing is the serving tray moves up and down. 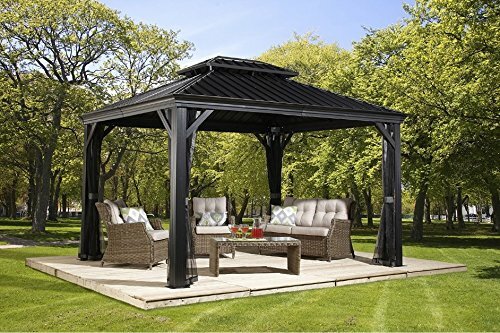 The price of the Palram Palermo Gazebo will leave your jaw hanging open. The canopy offers you a more permanent structure with hard top polycarbonate roof panels. The frame has a heavy-duty galvanized aluminum structure. The unit will withstand any wind and rain. There is a built-in gutter to prevent water damage. You receive anchoring and foot pads to keep the gazebo stable. You can even add curtains to keep out bugs with the built-in rails and hooks. Included you receive a ten-year warranty. 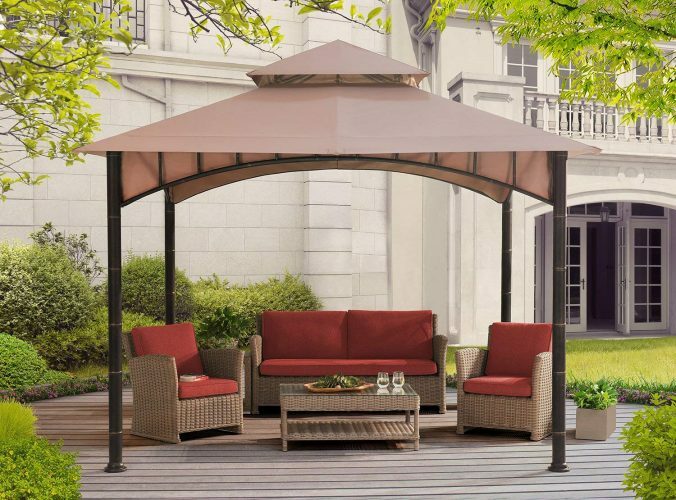 For a backyard haven, you need the best gazebo for wind and sun shelter. The Messina from Sojag is perfect with the galvanized steel roof. The charcoal color looks great, and the aluminum frames durable to last for years. You can keep the bugs out with the nylon netting, and there is no need of storing the roof away. If you ever need replacement parts or accessories, they are available to buy. Make your guests feel at home when having a BBQ with one of the top 10 best gazebos reviewed here. 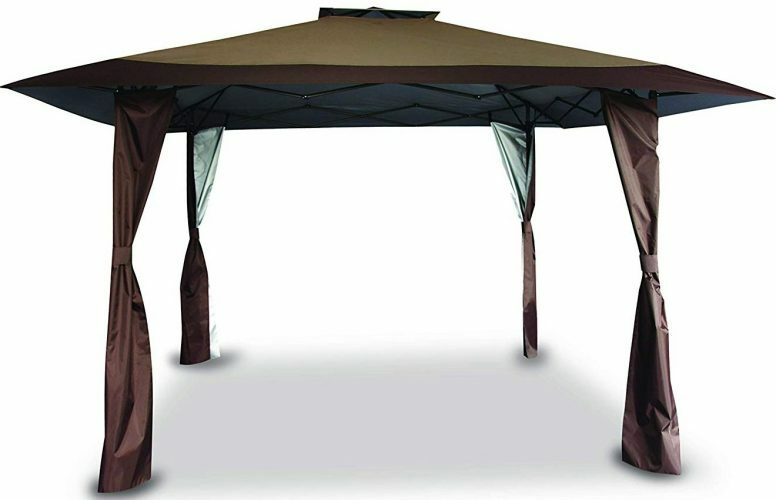 With one of these canopies, you can find a portable to permanent one to protect you from the sun, wind, and rain. The durable structure of the different canopies here will keep you protected for years to come.